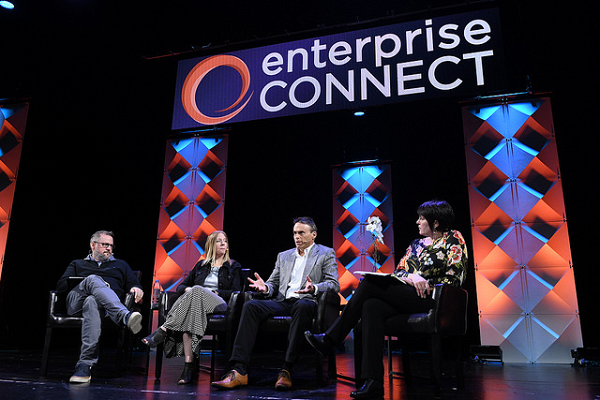 Familiar enterprise concerns and challenges resurface with modern twists on day one of Enterprise Connect. After months of prep and planning, Enterprise Connect 2018 officially got underway yesterday in Orlando, Fla. After morning breakouts, mainstage sessions commenced – with a vendor panel addressing team collaboration's future, followed by a smaller panel of enterprise IT executives focused on how emerging technologies are changing the nature of work and career progression under the enterprise communications umbrella. Shadow IT is one issue that came up in both of the morning panels -- far from a foreign concept to our audience of enterprise communications professionals. The session, "Is Team Collaboration the Future of Enterprise Communications?," comprised executives from vendors with team collaboration plays -- Atlassian, Cisco, Microsoft, RingCentral, Slack, and Unify. One of the comments that really struck a chord with the audience and other panel members came from Jonathan Rosenberg, vice president and CTO of Cisco's Collaboration Technology Group: "We all want tools that users love, but there's a role for IT, too. Too often today, each pocket selects its own thing, and the business winds up with a little Slack, a little Stride -- and frankly, it's a mess." IT's job is to provide guidance to the organization on which solutions to deploy and keep the environment controlled and from getting out of hand, Rosenberg continued. From his perspective, enterprise IT must work to put a stop to shadow IT because a multi-vendor team collaboration environment is too messy and unwieldy -- standardizing on a single solution should be the goal, he said. The shadow IT/multi-vendor environment discussion carried over into the next panel, "Your Next Job Today: How Emerging Tech Will Change What You Do and How You Do It." This session gathered three enterprise IT professionals -- John O'Meara, manager of UC and Integration Services at Boeing; Stacy Foster, Facilities and Technology director at Chemonics; and Chris Abrams, director of IT Shared Services, Yum! Brands -- all with unique experiences with how new technology is influencing IT jobs today and in the future. "There's a lot of shadow IT -- some using this tool, some using that tool," Abrams said. "The question becomes how do we get everyone to use one system and how do we maintain the security? Of course, my preference is one system, but it's tough will all the new stuff coming out." Seeing as how we've been talking about issues around shadow IT for years, as far back as 2007 with the dawn of smartphones, it appears that this problem is not getting any easier to solve with the variety of communication applications that have flooded the market. While some might argue -- and many would agree -- that choice is a good thing, the reality is the more team collaboration application choices, the bigger problems around shadow IT and standardizing within the enterprise become. 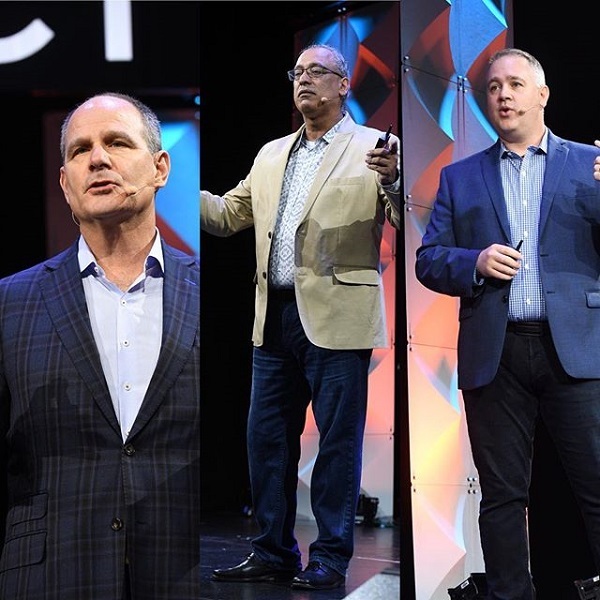 For the first time this year at Enterprise Connect, we tried out a new format on the main stage: 15-minute presentations from leading communications companies, followed by five minutes of Q&A -- what we're calling Industry Vision Addresses. Our first group of three visionaries -- Vonage CEO Alan Masarek; 8x8 CEO Vikram Verma; and Joshua Haslett, vice president of Strategic Innovations at Mitel -- took to the stage this afternoon. In their talks, all three industry leaders emphasized how now is a particularly exciting time for enterprise communications, with Masarek calling it a "communications revolution," Verma calling it "the greatest time" for enterprise communications, and Haslett calling it a "reinvention of communications." Whatever terminology used, their excitement circled around the trend that has enterprises transitioning to the cloud, representing a rethinking of how products and services are delivered and consumed. Masarek distilled things down to one underlying question: Does communications drive better business outcomes? His answer, of course, was yes: "Think of communications as rocket fuel for the enterprise," he said. "We're here in a fun time where we're moving to software and a platform -- it's a renaissance in communications where you'll no longer be tethered to one device. Communications is now going to be everywhere." Verma likened what's happening today in enterprise communications to what happened when Apple released the iPhone in 2007. The cloud enables all information to be tied together, he said, so that everyone in a company can access everything. "This is no different than what the iPhone did in 2007. We're finally getting there today in 2018 in the enterprise," he said. Finally, in Mitel's talk, Haslett highlighted the level of mass customization and personalization that the cloud now enables for communications. "What once was static is now dynamic," he said, pointing to the new software dynamic that has changed the way enterprises view their investments. With a push of a software update, enterprises gain access to new features over time "so your perceived value of the investment you made increases, not decreases," he said. On Wednesday, we'll hear from another group of three industry visionaries: RingCentral, Google, and Avaya. I, for one, am curious to seeing if the trends that emerged today will carry forward into these industry vision addresses and elsewhere throughout the conference program -- not to mention the keynotes, which kick off tomorrow morning. Couldn't join us in Orlando? Watch EC18 Keynotes, General Sessions & Industry Vision Addresses live!